Sinai Province head holds secret talks to expand cooperation and weapons smuggling, as covert ties between terror groups become clear. Shadi al-Menei, the commander of the Islamic State (ISIS) branch Sinai Province, is currently in Gaza on a secret visit to speak with Hamas leaders. The surprising revelation reported late Thursday by Channel 2 exposes the deep level of coordination between the terrorist organizations, which has been kept tightly under wraps. Al-Menei held talks with the heads of Hamas's "armed wing," the Al-Qassam Brigades, about expanding the cooperation between the groups according to the report. The channel notes that Hamas is being aided by ISIS in order to smuggle in weapons through the cross-border tunnels that Egypt's army has not yet destroyed, and in return is providing Sinai Province with advanced weapons such as Cornet anti-tank missiles which ISIS has used in Sinai against Egypt - including against an Egyptian patrol ship. The head of Sinai Province, which was called Ansar Bayt al-Maqdis before pledging loyalty to ISIS, has been a wanted man in Egypt for several years. Last May it was thought that he had been eliminated, but later it emerged that he survived the attempt. 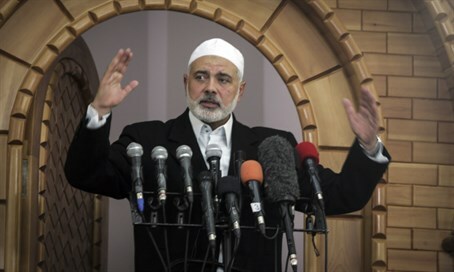 Al-Menei is responsible for the terrorist attack on Highway 12 in 2011, in which nine Israelis were murdered. He also orchestrated rocket fire on Eilat, Israel's southernmost port city. Back in July Israel announced it had information that Hamas had supplied ISIS with the weapons it used in a particularly brutal attack on Egyptian soldiers that left over 70 dead. Likewise, Hamas commanders were revealed as having supplied organizational support in the attack. Days after the revelation, a senior IDF officer said Hamas was cooperating with Sinai Peninsula to keep its influx of weapons going through smuggling tunnels, and prepare for its next war against Israel. Hamas, for its part, repeatedly rejected announcements by Israel that it is aiding ISIS, which is also gaining a foothold in Gaza itself through local Salafist groups voicing support for ISIS. Those groups are in conflict with Hamas, but are also not official branches of ISIS like Sinai Province is. "Hamas is fighting ISIS in the Strip, but on the other side there is cooperation between Hamas elements from Gaza and ISIS in Sinai," Defense Minister Moshe Ya'alon (Likud) explained in July.